I once tied a bear bag with a haphazard bundle of knots, and despite being seemingly impossible to untie, it came loose when lowering the bear bag and nearly smoked my friend standing under it. 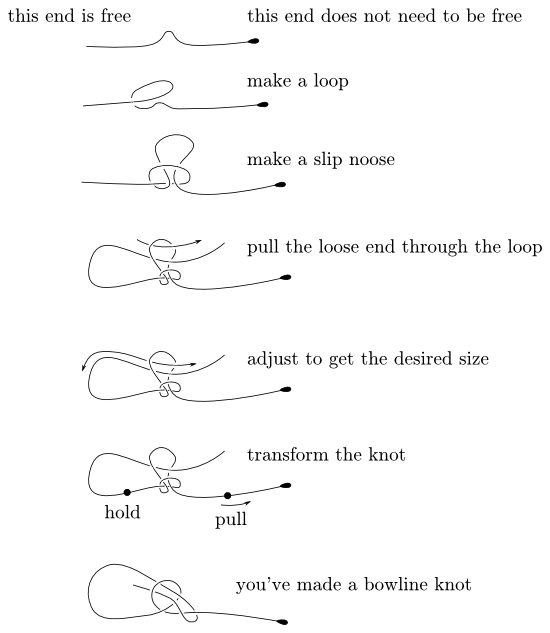 What are some good knots to learn for most stuff encountered while camping / backpacking? Once you've mastered these, you should start understanding the dynamics of how knots can make ropes do all sorts of cool things. It's important that you practice these and know them well. You don't want to make a mistake and then trust a heavy load or your safety to a knot that might slip. 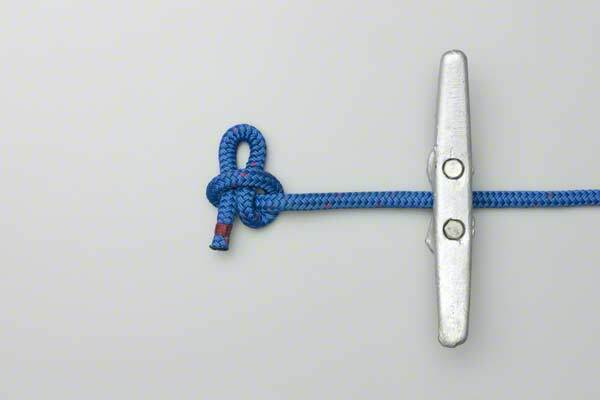 The most important knots you'll ever need to know are the taut-line hitch and the bowline. For instance, on your bear bag, you would tie a bowline through a handle or other loop the bag, and then the taut-line on the other side. The best thing about a bowline is that no matter how much force you've put on it, you can crack it easily to take it apart. To prolong the life of your rope, protect it from dirt, sunlight, chemicals, and abrasion. When you store a rope, coil it following its natural lay. Don’t wrap it around your arm and through your outstretched hand like an extension cord. Keep it in a bag for storage. The fortified square knot strengthens the basic knot by adding an overhand knot to each end, which makes it less likely to slip. Wrap the rope around a secure object such as a tent stake. Bring the leading end under the standing rope and wrap the end around the standing part two times. Finish by bringing the leading rope above the two loops and finish with a half hitch; pull tight. Place two lengths of rope parallel to each other. With the leading end of the lower rope, tie two overhand knots around the upper rope; pull the knot tight. With the leading end of the upper rope, tie an overhand knot around the lower rope. Wrap the rope around a post and cross it. Wrap the leading end of the rope around the post again and tuck it under itself below the cross. Form the rabbit’s hole by making a loop in the rope. Take the leading line (the rabbit) up through the hole. It goes back into the hole. Pull both ends of the rope to finish the knot. 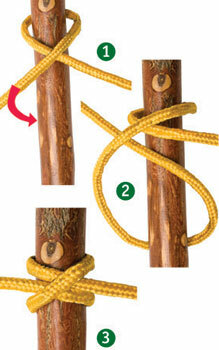 Tie a grapevine knot to make a secure loop. secure the cord with the grapevine knot around another rope. 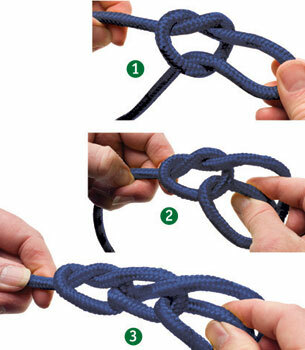 Make an overhand slip knot. 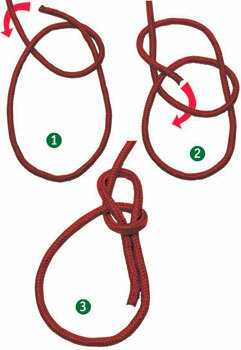 Pull the loose end through to make another slip knot. Repeat as many times as necessary and pull tight. This entry was posted in Camping, Camping Advice and Tips, Outdoors and tagged Boy Scouts of America, Knots, Scouting. Bookmark the permalink. The trucker's hitch can be cinched very tight and it's easy to add or remove tension. It's useful for tying down loads (on boats or roof racks), applying variable tension (e.g., for tarps or hammocks), and winching. It can be undone with a quick pull. The bowline is perfect for anchoring the end of a rope to a fixed object. It doesn't tighten when pressure is applied, and it's easy to undo. It's a good one for hammocks, tarps, tow lines, and tying up boats. The square knot is for tying the ends of two shorter ropes to one another to make a longer rope. 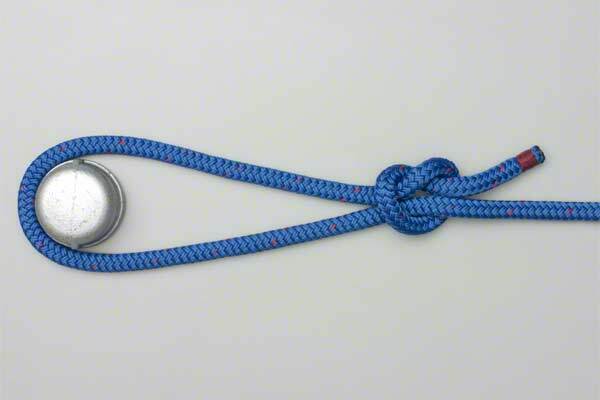 The figure of 8 knot can be used instead of the bowline. It has a somewhat higher breaking strength. It is also very easy to untie even after being loaded. You might want to consider the alpine butterfly, it can be used whenever you need a standing loop on a rope. It is also considered climbing safe. does it have good mechanics, knots have different mechanics, some work well under load, other work well if the force is applied in some particular direction, etc. ; for example, it's not good if the rope is bent too much, another example could be the overhand loop which is terribly bad as a loop-in-the-middle knot (applies too much stress). It might look complicated at first, but with a real rope (instead of pictures) it's actually simpler than the standard way. The only thing to watch for, is to ensure that the knot transforms, that is, the slip-knot part does slip, in the process pulling the free end inside (it's important because the knot is not secure before). 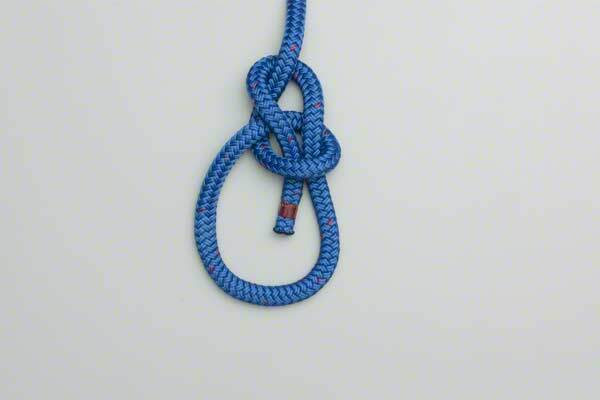 It's one of the basic knots. It's easy to modify and accomodate to other needs, e.g. see figure-eight loop. It's frequently a better choice than just the overhand knot. It's simple and well-known (your colleague might use it). It is crucial to know that the second overhand should be tied with different orientation, otherwise it results in the insecure granny knot. The surgeon's version adds additional security (not exactly, but it's close enough interpretation). It's a very useful loop-in-the-middle knot. Other knots of similar function are complicated (the simple ones are insecure or have bad mechanics). The butterfly bend is the same knot and a quite secure bend. Still ok if tied incorrectly (i.e. the left-hand sheet bend is much better than granny knot). You can add a second loop (i.e. double sheet bend) for additional strength. 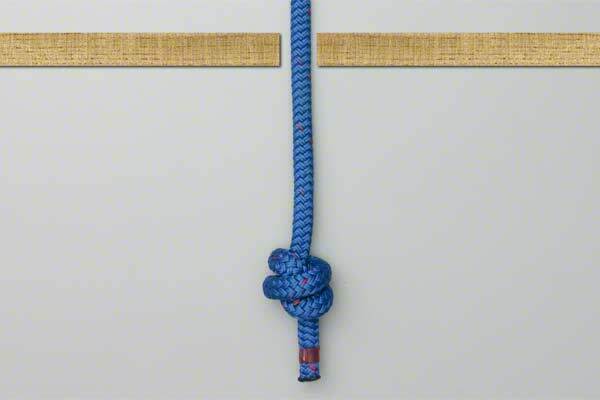 It works great even if the ropes are of different diameter (the simplest knot with this property). Clove hitch is easy to remember because of its symmetry (you can immediately tell if something is wrong). Clove hitch is a base for many other knots, e.g. see the water bowline. It is useful by itself, e.g. see the rolling hitch. The #1674 is my personal favorite for attaching a rope to an object: it's almost a clove hitch, secure and doesn't jam. 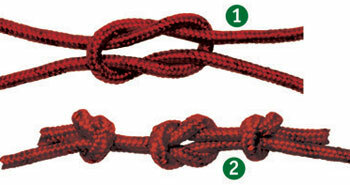 In fact, any of the Miller's knots, constrictor knot, transom knot would do, so whatever you tie should be ok. The knots I use the most while camping is the Taught-line hitch, Siberian hitch, Trucker's Hitch, Prusik Knot, Figure 8 loop, and the slip knot. 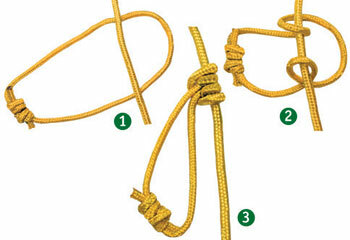 In fact these are the only knots I ever use, besides tying my shoes. A great easy way to rig up a ridge line between two trees is to use the Siberian hitch and Trucker's hitch. The Siberian hitch allows for a quick anchoring of one end of the rope to a tree. And then a Trucker's hitch on the other end allows for you to pull the rope nice and tight. Both knots have a slip-knot release, so take down is easy! Tying two pieces of line together requires a "bend". Three common bends are square (reef) knot, sheet bend, and fisherman's bend. Each has some advantages over the others, and these are important to understand, but they all have the same effect (specifically, joining two lines...). A "hitch" is used to fasten a line to a stationary object (be it a limb or another line). Three common hitches include a round turn with two half hitches, a tautline hitch, and a timber hitch. Again, each hitch has advantages over the others, but I would know AT LEAST one of these. Some hitches such as a prussik or icicle hitch have a "slip and grip" property which can be very useful when done correctly. Finally, some knots create a "bight" (loop) in the line. Most of these create a bight at the end (bowline, fisherman's loop), but some (alpine butterfly or directional figure eight) can be used to place a loop in the middle of the line. 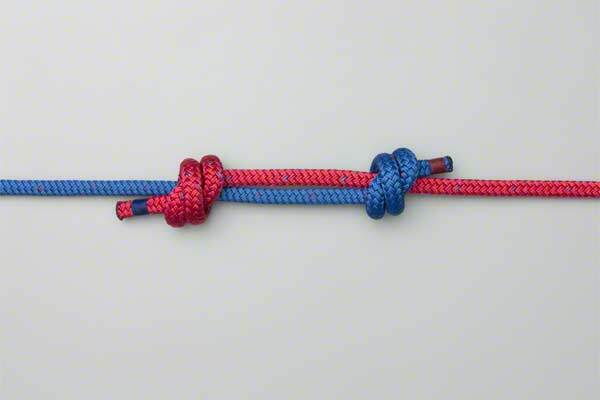 As you continue to learn knots, be sure to understand what makes them different from others of the same type. Some knots are more suitable for natural fiber cord rather than synthetic cord, some jam easily where others are easier to untie, and some have unique properties (adjustable, decorative, strength, etc). Once you've learned the basics, you will begin to develop preferences which work for you. Perhaps more important, you will begin to recognize how each knot should be applied correctly or used in more complex applications with other knots. If you want a great way to test your basic outdoor knot skills, attempt to hang a tarp using nothing but cord. Personally, I find that I use half hitches (sometimes slipped), alpine butterflies, trucker's hitch, and tautline hitches among others. Not the answer you're looking for? Browse other questions tagged camping backpacking ropes knots or ask your own question. How do I tie a double fisherman's knot? How do I tie a stopper knot? What's a good resource for learning to tie knots for climbing?